1 What is included in the cleaning after repair? Even after small repairs in the apartment, a lot of construction waste remains, which means more serious tasks, such as changing the flooring or installing new windows. Many people are horrified, watching what the front for cleaning is to be. If you have the same condition, do not be upset - there are many ways to do the cleaning after the repair with minimal loss of time and mood. So, how exactly should the cleaning be done after the repair, so as not to spend a lot of free time on it? What is included in the cleaning after repair? Cleaning of lamps, chandeliers and other lighting fixtures. Cleaning walls, floors, ceilings and any other surfaces from building dust. Cleaning doors, windows and window sills, windows and slopes from dirt after repairs. Cleaning upholstered and cabinet furniture, cleaning baseboards and radiators. Wet and dry floor cleaning in all rooms. Removal of debris outside the apartment or house. This list of works can be adjusted based on your own preferences. Companies that specialize in cleaning after repair work according to the above plan. All materials that remain after the completion of repair work and you no longer need it, immediately throw it out of the apartment. You shouldn’t indulge yourself with hopes that sooner or later you will need some of this, you don’t need to store building materials and other stuff in a closet, pantry or mezzanine. Initially, make yourself an installation to use all materials for repair, and throw off the remnants. If there is a lot of construction debris after the repair, and you do not have personal transport, it is better to spend some money and hire experts or at least a truck with which the garbage will be taken out. This advice is also relevant for car owners, since large volumes of garbage will have to be taken out in several visits, and the car’s interior can be easily ruined by this. General cleaning after repair undoubtedly includes the cleaning of small debris, and here it is important not to use an ordinary vacuum cleaner. Otherwise, it will quickly fail, and you will have another problem. If there is an urgent need and there is too much small debris, it is better to take construction vacuum cleaners from your friends or rent them in special companies. They are designed for cleaning small construction debris, so they will not fail, unlike a household vacuum cleaner. After repair, fine dust will remain on the surfaces in the room, which must also be properly cleaned. To remove construction dust, you must use microfiber cloths. Dry cleaning will not give results, so you need to moisten the cloth in a solution of water and vinegar. Such a solution very quickly removes dust, unlike ordinary water - just try it. When the house is cleaned after repair, there are often stains from solvent and other substances that are used in the repair process. Unfortunately, there is no universal remedy for stains; therefore, it is important to understand what a stain consists of and then find recommendations for removing such a stain. Foam should be removed before it dries. Of course, the frozen construction foam can also be removed, but it will take much more time and effort, and it can also be removed only mechanically. Traces will remain on the surface after the hardened polyurethane foam - they will have to be removed with a special cleaner. In addition, it is not possible to completely remove traces of foam from embossed coatings - such surfaces will have to be changed. Often lacquers, paints and lubricants remain on the laminate and floorboard after repairs. How to remove them? This can be done with the help of ordinary acetone (budget option), and with the use of special tools designed specifically for laminated floors. Such tools do not harm laminate and parquet, therefore, are more preferable for use. Rust stains, which are a consequence of construction and repair work, can be easily removed using copper sulfate in the form of a solution. Small pockets of rust can be wiped with a cloth moistened with concentrated acetic acid (this way you can clean the taps). Traces of glue or tape left on linoleum are easily removed with a solvent. It is senseless to use alcohol for these purposes, since nothing will work out. Also, do not wash glue and tape from linoleum by mechanical methods and abrasive powders - this can only be harmful. Following these tips will not only save time but also do not damage surfaces, furniture and other expensive items during unsuccessful independent experiments. What else you need to know about cleaning? If everyone has his own answer to the question of how to start cleaning after repair, then many do not know what it is worth finishing this cleaning. Several recommendations can be made on this point. So, one of the final stages should be dry and wet cleaning. 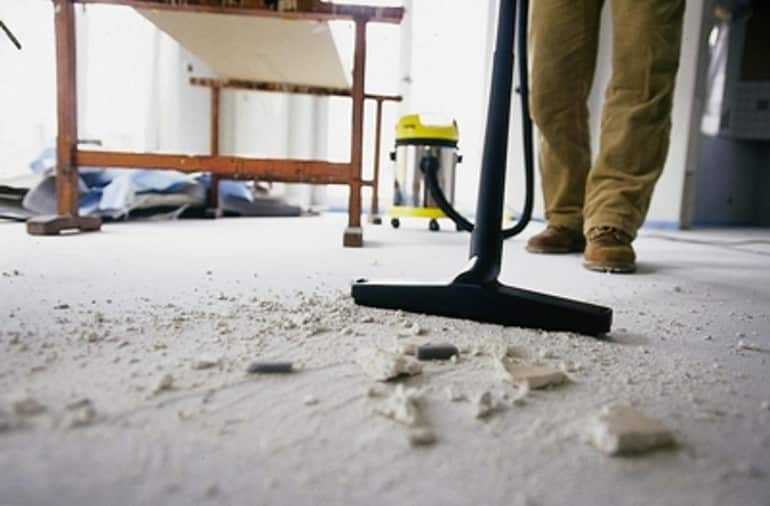 During this event with microfiber cloths all surfaces, including furniture, lamps, chandeliers, floors, taps and plumbing, heating batteries and in general everything that construction dust can cause during repair, are thoroughly wiped off from construction dust. Another good way to finish cleaning after repair is to rub all wooden surfaces with polish. This can be done with wooden furniture, doors, window frames made of wood, as well as other items made from this material. This should really be the final touch, since after cleaning with polish it is impractical to continue cleaning. Now you understand how to do the cleaning after the repair, so that nothing says that the house was recently a pogrom in connection with the repair work. Use these cleaning tips after repair, and then cleaning the premises will not be so painful and unpleasant for you. All about how to quickly and efficiently wash blinds of any type.